Biznovations Podcast is LIVE on iTunes! I am extremely excited that the Biznovations Empowercast is now available for your listening pleasure. Similar to this blog, I will focus on topics that will equip and energize leaders, entrepreneurs, change agents, and social innovators. My goal is to help you maximize your potential and profitability! Go to www.paulwilsonjr.com to get your dose of audio inspiration! You can also go directly to iTunes and download the episodes to your computer, iPod or other mp3 player. Let me hear from you if you enjoy what you hear from me. I look forward to your feedback. In my last posting I introduced the concept of Community Development Visioneering. One critical group of people who are integral to the transformation of our communities is youth. Within this growing segment of the overall population is an army of talented, strong, intelligent group teens and college age students who are often misled, misused, misinformed and misunderstood. It is almost absurd when I think of the amount of untapped potential that our young people possess that is wasting away. If we want a successful and prosperous society generations from now, then we had better start doing a better job of developing our youth today. My vision for youth is to help them unleash their potential and find their personalized pathway to success. One way to accomplish this is through specialized education and training. I have created several inspirational presentations and interactive workshops that will equip, enrich and energize youth to change their world. These customizable, high impact programs were designed to help high school and college students discover their unique qualities, expand their vision, and catalyze their potential. Key topic areas include life planning, leadership, and entrepreneurship. All of these sessions can be delivered as inspirational keynote addresses or interactive workshops. Dream B.I.G. in 3D!™: A fun, interactive session to help high school and college students discover and develop their hidden talents, abilities, and interests in order to create a personalized life success roadmap. Hi-Def Leadership™: This dynamic, high energy session was creatively designed to help students identify their personal leadership style, so they can increase and expand their influence and impact on their campuses and in their communities. P3: Passionately Purposeful Profits™: An enlightening, high-impact session that will teach and inspire students to use their personal interests, creative abilities, and educational experience to BYOB... “build your own business.” They will learn how to find and flourish in their life mission by developing and launching a passionately purposeful and profitable mission driven business. Click here to learn more about mission driven entrepreneurship. Contact me today to schedule one of these power-packed, transformational forums for your school, church, association, or non-profit. You can reach me at empowerment@biznovations.net. I am very excited about these opportunities to help your students maximize their potential and drive positive changes on their campuses and in their communities! In our communities today it's easy to see the problems of crime, homelessness, poverty, illiteracy, disease, poor educational performance, teen pregnancy, abuse, corrupt leadership, and so on. What is much harder to see, though, are the solutions to the myriad of problems that are negatively impacting the lives of children and adults in our communities every day. As I described in my last posting, Visioneering Diversity Value, visioneers are able to execute positive possibilities in situations that others only see as problems (click here to learn more about visioneering). I have a vision to see impoverished communities economically and socially empowered through the development and expansion of minority owned businesses in those communities. My conviction is that in a country that is considered to be the richest in the world we should have a lot less people living in impoverished conditions. I believe it is possible to engineer practical solutions that can be utilized to improve the lives of millions of people, from New Orleans to Africa. I also believe the most overlooked and untapped resources needed to improve these communities already exist within those communities. Based on our current situation today, those of us who are committed to positively impacting other people's lives need to start doing things differently. It is imperative that we start bringing together entrepreneurially-minded people in corporations, minority businesses, faith-based organizations, advocacy agencies, and other relevant groups to develop comprehensive yet practical plans that will empower people to improve their living environments. This team needs to be willing and able to think beyond traditional community development models and failed experiments of the past. From an entrepreneurial perspective, there has to be a willingness to take risks and try new approaches that have never been attempted before. Providing education in the areas of business, economics, finance, and public policy. Training on how to successfully develop and operate a small business or micro-enterprise. Developing business incubators that can be used to expose participants to situations in which their new knowledge and skills can be applied. Creating an overall atmosphere that removes barriers and establishes opportunities for success. Start seeing situations through the perspective of possibility versus the purview of problems. Your perspective of a situation will change your response to the situation. Nothing is impossible. Talk passionately about your ideas with other people. You never know what type of resources someone else may have to invest in your vision. However, because most people are probably going to be more pessimistic than you are, don't allow them to dampen your enthusiasm. Collaborate and brainstorm potential solutions with other like-minded people. You don't have to be a "lone ranger." You may have only one piece of the solution puzzle while someone else may have another. Start small. You don't need a complex strategic plan to begin to implement your ideas. Starting small is probably the best way to test some of your ideas to see if they work before trying to impact a large group of people. Be the change you want to see in your community. It starts with you. Don't complain about something that you're contributing to or that you're not willing to do anything about. One of the things that people need the most, but is in short supply is... hope. They need more than just hope, though. They need hope that's backed up by action. They need to be equipped with knowledge, skills, tools, and encouragement to succeed, so they can develop and execute a vision for their lives that is greater than what they may have ever thought was possible. There is no problem in this world that cannot be solved with the right combination of faith in God, passion, ideas, time, money, and perseverance. The question is are you going to be a "problem-peddler" or a problem-solver? I hope you will choose the latter. Join me today to visioneer practical solutions that will empower millions of people to live healthy and fulfilling lives. 1) What Really is Empowerment? I first heard the term "visioneering" a few years ago, as it was used by author Andy Stanley for a book which he wrote using that word as his title. He defines visioneering as the engineering of a vision, and he defines vision as a clear mental picture of what could be, fueled by the conviction that it should be. I believe a lot of people have the ability to envision a picture of what they think something should be. Unfortunately, a lot fewer of them are able to transform their visions into reality. Visioneers on the other hand have the ability to visualize incredible value in opportunities that others may not see. However, they don't stop at "pie in the sky" thinking and ideas. They are able to engineer practical solutions that bring value and success to the situations that they encounter. My vision for Supplier Diversity is that eventually there would be no need for this department, because it would be so integrated into a company's operations that oversight and advocacy would not be necessary. This vision is driven by my conviction that diverse businesses, when given the right opportunities, are just as capable of providing high quality, competitive products and services as majority owned businesses are. One way to engineer this vision is to have more effective Supplier Diversity programs in corporations. Based on the changing demographics, increasing buying power, and upsurging business growth in minority groups, companies today should be even more embracing of Supplier Diversity than they currently are. Yet from my experience as a Supplier Diversity coach and consultant, many hearts and minds still need to be convinced of the value that Supplier Diversity adds to corporations. Supplier Diversity is one of the main areas in organizations that is often overlooked in terms of adding value to the bottom line. Consequently, it is often relegated to the back burner as it relates to a company's corporate strategy. This initiative still gets the compliance treatment in many companies, i.e. "we're doing it because we're being forced to do it." Nevertheless, this area is an untapped source of value and innovation which corporations need to explore, especially with the constantly increasing pressures to grow in this demanding global business environment. One of reasons that Supplier Diversity is in this situation is the fact that the success of most of these programs is too often determined by performance measures that are irrelevant and detached from the company's other operational and financial goals. This only does Supplier Diversity a disservice and further alienates it from other "important" initiatives that are happening in the company (this is also one of the key reasons why human and financial resources are scarce for most Supplier Diversity departments). It's no wonder that the employees and minority businesses associated with this area carry the stigma that this is a just social program or is only driven by compliance requirements. If planned, developed, and executed with the right perspective, Supplier Diversity can be a significant contributor to a company's operational, financial, and economic development goals. To make this happen, though, the same rigor and intensity in terms of developing and executing a strategic plan has to be applied to Supplier Diversity just as it is in other areas of the company. This initiative must be given the same consideration and held up to the same standards as other departments in regards to structure, processes, productivity, systems, standards, resource allocation, and performance measures (especially those other than spend dollars). If visioneered effectively, Supplier Diversity can be an incredibly powerful vehicle to drive creativity and entrepreneurial thinking. Just like other suppliers, diverse businesses increase supply chain capacity and flexibility, drive innovation, deliver cost savings, and provide market intelligence. Key initiatives that can be enhanced through Supplier Diversity's intentional integration are strategic sourcing, marketing, product design, operational improvements, organizational change, economic development, and community outreach, among others. With this being the case, companies can actually gain a competitive advantage by developing and adhering to purchasing processes that are inclusive of all types of qualified suppliers. The more open a company is to allowing diverse businesses to compete on a level playing field, the more they will prosper from the power of inclusion. Supplier Diversity is one of the greatest untapped resources for economic growth in corporate America. Right now, though, the onus is on Supplier Diversity to prove their value to corporations beyond the social and compliance aspects. I will steal a line from one of our former Presidents and say, "Ask not what your company can do for Supplier Diversity. Instead ask what Supplier Diversity can do for your company." Don't just say it, but prove to those with the financial resources that Supplier Diversity adds significant value. Supplier Diversity managers and minority business owners need to figure out new, creative ways of thinking, operating, and working together so that they can to help make these programs contribute more measurable value to corporations' operational, financial, and economic development goals. Only then will Supplier Diversity get the focus, respect, and resources it needs to operate as a truly strategic, value-adding initiative. If you have read any of my previous posts about Africa, such as "Entrepreneurs Needed in Africa", you know how passionate I am about Africa and my desire to use entrepreneurship as a driver to empower the people of Africa economically and socially. Now, there is a book available that brings to life the accomplishments and triumphs of African entrepreneurs. 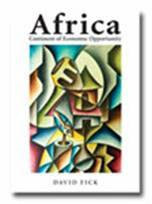 STE Publishers has just published Africa: Continent of Economic Opportunity by David S. Fick. This rollercoaster of a book is bursting with innovation and ideas and will change your view of Africa forever(click here to get the book at Amazon.com). The development of Africa is a subject that concerns not only the continent but the rest of the world. Having travelled extensively throughout the world and researched this book for six years, David Fick remains optimistic about the future. Everywhere, he has seen how small businesses are creating jobs and transforming economies. In Africa: Continent of Economic Opportunity, Fick shows how a wide range of businesses in Africa are succeeding in spite of enormous social and economic challenges. He presents a vast and diverse array of case studies of small, medium and large business enterprises and community projects in every country throughout the continent, showing how all citizens of this extraordinary continent can become successful with a little imagination, education and persistence. Fick is also the author of Entrepreneurship in Africa: A Study of Successes (click here to get the book at Amazon.com) and is currently researching his third book, African Entrepreneurs in the 21st Century (coming in 2008), which will feature examples of African entrepreneurs who have demonstrated visionary and strategic entrepreneurial leadership across the continent. Furthermore, Fick donates all author's royalties due to him from the sale of his first - and this, his second - book to Médecins Sans Frontières/Doctors Without Borders (MSF) in support of their medical relief projects in Africa and will do the same when his third book is published. If you are even remotely interested in the growth and sustainable development of Africa, especially through entrepreneurial ventures, I would highly recommend David's books.